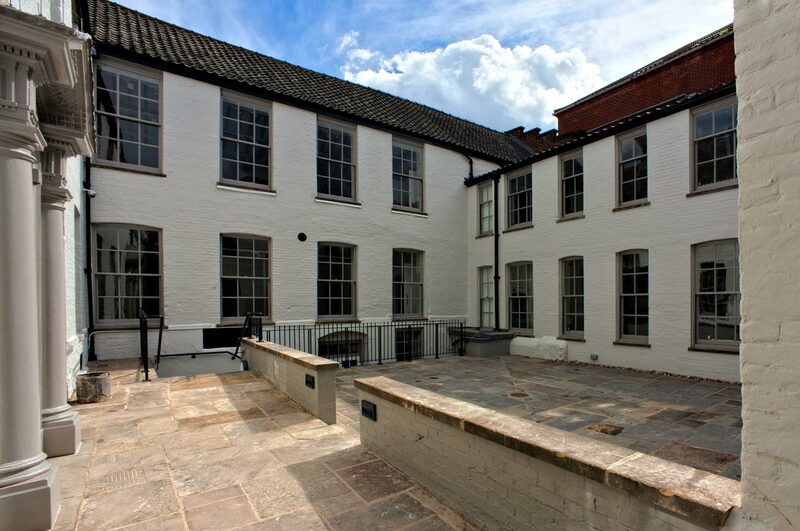 Over the centuries the Grade 1 listed Bridewell was used as a merchant’s house, a prison, a tobacco store and shoe factory before it became the City Museum in 1925. The display areas are ranged around a central courtyard and sit above a 14th Century vaulted under-croft, the largest in Norwich. A key objective of the project was to improve accessibility, so a new main entrance from Bridewell Alley has been created, with a platform-lift and steps up to a new reception area. The glass lobby-screen enables the steam fire pump (from the Coleman’s mustard factory) to act as the centrepiece of the Reception. The new polished white concrete floor is made with local flint aggregate, elevated to a terrazzo-like quality through repeated grinding and sanding. Externally the courtyard has been re-paved and the buildings fully re-decorated. New external steps give access to the under-croft direct from the courtyard. The Museum is expected to re-open in 2012, after the client has completed the display fit-out.